Additional Info: The plant grows as a bush in Sri Lanka and India. It is specially raised across the globe. Used For: The herb is known to reduce pains, kill bowel helminthes, boost sexual libido, relieve flatulence, and promote expectoration. The range of diseases in which the herb is applied includes: intestinal worms, sciatica, rheumatic pains, paralysis, laryngitis, gout, flatulence, epilepsy, indigestion, coughs, colds, bronchitis, asthma, and abdominal tumors. Seeds are particularly applied to treat sore throats and coughs. Root is especially useful in aching joints, epilepsy, and paralysis. Both root and seeds are applied for consumption, leprosy, rheumatism, and coughs. 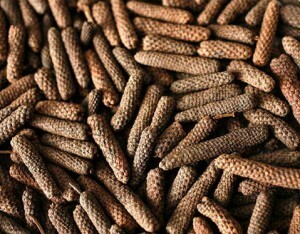 Long Pepper is also thought to increase one’s lifespan. Preparation and Intake: The commonly used forms of medicine are oil, powder, and infusion. Safety: There is no data concerning the plant’s safety level. Exercise care. Herbs in Ayurvedic medicine are commonly applied together with other herbs to reduce the negative effect one of them may produce on the organism. Not recommended to take without careful medical control.